↑ "এই গ্ৰীক গীতে ১৯৬৬ চনত ৰাষ্ট্ৰীয় সংগীত হিচাপে স্বীকৃতি লাভ কৰিছিল।". http://www.presidency.gov.cy/presidency/presidency.nsf/prc34_en/prc34_en?OpenDocument। আহৰণ কৰা হৈছে: 3 June 2015. ↑ United Nations, Department of Economic and Social Affairs, Population Division (2013). World Population Prospects: The 2012 Revision, Highlights and Advance Tables (ESA/P/WP.220). প্ৰকাশক New York. p. 52. http://esa.un.org/wpp/Documentation/pdf/WPP2012_HIGHLIGHTS.pdf. ↑ "Statistical Service – Population and Social Conditions – Population Census – Announcements – Preliminary Results of the Census of Population, 2011" (Greek ভাষাত). Statistical Service of the Ministry of Finance of the Republic of Cyprus. 29 December 2011. http://www.cystat.gov.cy/mof/cystat/statistics.nsf/All/732265957BAC953AC225798300406903?OpenDocument&sub=2&sel=1&e=। আহৰণ কৰা হৈছে: 29 January 2012. ↑ 5.0 5.1 5.2 5.3 "Report for Selected Countries and Subjects". World Economic Outlook Database, October 2015. প্ৰকাশক Washington, D.C.: International Monetary Fund. 6 October 2015. http://www.imf.org/external/pubs/ft/weo/2015/02/weodata/weorept.aspx?pr.x=28&pr.y=2&sy=2014&ey=2014&scsm=1&ssd=1&sort=country&ds=.&br=1&c=423&s=NGDPD%2CNGDPDPC%2CPPPGDP%2CPPPPC&grp=0&a=। আহৰণ কৰা হৈছে: 12 October 2015. 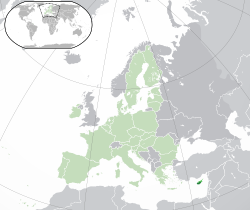 ↑ The .eu domain is also used, shared with other European Union member states. ↑ "United Nations Statistics Division- Standard Country and Area Codes Classifications (M49)". UNSD. http://unstats.un.org/unsd/methods/m49/m49regin.htm#asia। আহৰণ কৰা হৈছে: 20 May 2015.